The Portland Trail Blazers will face a familiar foe to start their 2018 NBA Las Vegas Summer League schedule. Each team will play five games. Following the three-game preliminary round, it turns to a tournament format will guarantees each team two additional games; possibly more depending on the results. A championship game will be held on June 15. Last year's Blazers Summer League team made it to the championship game before falling to the Los Angeles Lakers. Portland will be face the Utah Jazz to open the Summer League. The teams open the Las Vagas Summer League against each other for the third consecutive season. Due to their geographical proximity, the teams typically meet twice during pre-season play in October. The Blazers also will face the Atlanta Hawks and the San Antonio Spurs in their first two games. The Las Vegas Summer League is one of three summer leagues which take place. Sacramento and Salt Lake City play host to a pair of others. The Las Vegas Summer League is held in two facilities on the University of Nevada at Las Vegas, Cox Pavilion and the Thomas and Mack Center. Schedules, rosters and results will be updated as they become available. Where applicable, click on the link for the boxscore on nba,com. The Blazers summer league schedule appears below (all times are pacific). 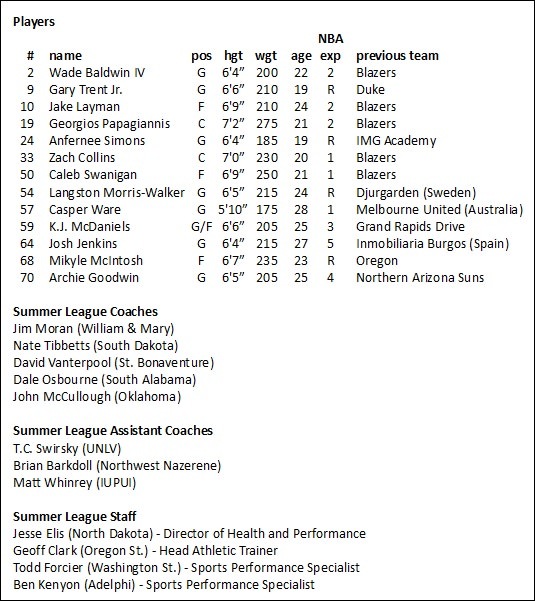 Guard Anfernee Simons, whom the Blazers selected with the 24th overall pick in the 2018 NBA Draft is among the players on the Blazers' Summer League roster. Also on that roster is Gary Trent, Jr., the 37th overall pick who was traded to the Blazers on draft night. 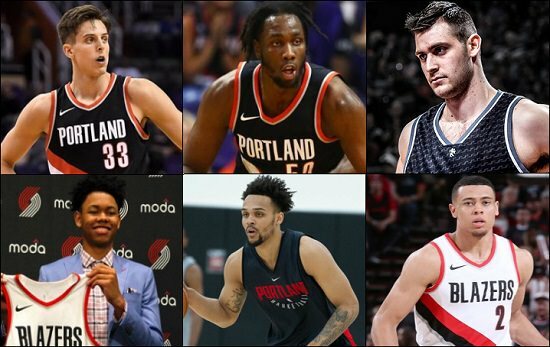 Returning Blazers under contract with the Blazers who will complete in Las Vegas include 2017 first round picks, center Zach Collins and forward Caleb Swanigan, as well as center Georgios Papagiannis. Forward Jake Layman and guard Wade Baldwin IV, who played for the Blazers last season, are also on the roster. Those players, and others, will look to show Blazers' brass and fans what they can bring to the team. The Blazers summer league roster appears below. This roster is subject to change. While some players use Summer League as an opportunity to show they deserve a roster spot, others use the tournament as an opportunity to get noticed by other teams. The following are the full schedules of all three NBA summer leagues. Nationally broadcasts are noted in parenthesis. All games are being played at the Thomas & Mack Center and Cox Pavilion in Las Vegas. All times are pacific. All games were played at the Huntsman Center, on the campus of the University of Utah in Salt Lake City. To be posted as they become available.